Comparisons across cooperatively breeding species show how nonessential a sapient mentality is for shared care, and provide our best hope for understanding what selection pressures induce individuals to help rear someone else’s young. Insights from such comparisons help explain why mothers among highly social apes living in Africa about 1.8 million years ago might have begun to abandon mother-only care, setting our ancestors on the road to emotional modernity. Although at first caring for and provisioning someone else’s offspring seems to defy evolutionary logic, cooperative breeding has evolved many times in a taxonomically diverse array of arthropod, avian, and mammalian species. It occurs in 9 percent of the 10,000 living species of birds and in perhaps 3 percent of mammals. The advantages for parents are well documented, with significant demographic consequences. Mothers able to confidently entrust helpless offspring to groupmates’ care conserve energy, stay better nourished, and remain safer from predators and other hazards, leading longer lives with greater reproductive success. Because mammal mothers that have aid also wean babies sooner, many reproduce again sooner, and so give birth to a greater number of young over their lifetimes. More important, the extra help ensures the young have a better chance of survival. Certain species therefore spread successfully thanks to cooperative breeding and, with it, a faster pace of reproduction and the flexibility permitting young to survive in a wide range of habitats. But how could natural selection ever favor caring for someone else’s young? Why would young magpie jays in Costa Rica, ones that have never reproduced, bring back beakful after beakful of food to begging fledglings? Those allomothers often provide more food than the chicks’ own parents do. Ornithologists J. David Ligon of the University of New Mexico and D. Brent Burt of Stephen F. Austin State University in Texas propose a two-step process for such development. Start with a species with particularly helpless, slow-maturing young, in which selection will favor high sensitivity to the cues emitted by needy babies as a parental trait. Then add some special benefit that encourages maturing individuals to linger in their natal place, such as defensible and heritable resources. As a result, group members will be exposed to sensory cues from chicks (or pups) and will be primed to respond. This “misplaced parental care” hypothesis helps explain why cooperative breeding is three times more likely to evolve in taxa that produce altricial (helpless) young rather than precocial young (those that are soon able to survive on their own). Not all such caretaking is as self-sacrificing as it may appear. Often, alloparents only babysit when no more self-serving option is available. They may proffer food only when they do not actually need it themselves. They may volunteer only when they have energy to spare, or when they are still too young or lack the opportunity to reproduce themselves. Or if two cohabiting mothers are reproducing, as occurs among lions, ruffed lemurs, bush babies, and some mice, they may take turns as alloparents. One mother may suckle the other’s offspring while the other mother is “at work” foraging. And where practice is critical for learning how to parent, as is the case for many primates, babysitters derive valuable experience by first caring for another’s young. In other cases, however, helping is more of a one-way street—and by no means entirely voluntary. Subordinate meerkat, wild dog, and wolf females that have never conceived (and may never do so) sometimes undergo a “pseudopregnancy,” developing a swollen belly and mammary glands. Then, once the alpha female’s pups are born, the nonmothers secrete milk for the alpha’s pups. By becoming a wet-nurse, a subordinate may increase her chances of being tolerated in the group. Had she given birth herself, her young might have been killed by the alpha female. 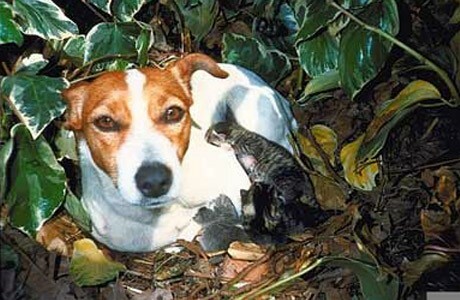 Perhaps after mating and undergoing a pseudopregnancy, a Jack Russell terrier belonging to the author’s neighbor chased away a mother cat and nursed the litter herself. Babies can be magnetically attractive to others, even members of a different species. It has been hypothesized that under some circumstances such misplaced parental care could lead to the evolution of cooperative breeding. Of course, it makes good evolutionary sense for individuals to enhance the reproductive success of relatives with whom they share genes. But helpers are not always kin, and even kin can be less than kind: some meerkat and marmoset alphas eliminate their own daughters’ offspring—the grandmothers from hell. In roughly half the 300-odd species of living primates, including all four great apes and many of the best-known species of Old World monkeys, such as rhesus macaques and savanna baboons, mothers alone care for their infants. A chimpanzee, gorilla, or orangutan mother will be literally “in touch” with her infant for almost every moment during its first six months of life, and the orangutan nurses her baby for up to seven years. Such continuous maternal care cannot be attributed to lack of interest from would-be babysitters, however. In all primates, babies are a source of attraction, most often to subadult females. The mother’s possessiveness is the determining factor. A wild ape mother is adamant that others will not hold or carry her baby. Elsewhere in the primate order, mothers are more tolerant of allomaternal overtures. Shared care with at least minimal provisioning (often no more than one female allowing another female’s infant to briefly nurse) is found in some 20 percent of primate genera. But only among marmosets and tamarins, members of the family Callitrichidae, do we find shared infant care combined with extensive alloparental provisioning, such as we also see in humans. 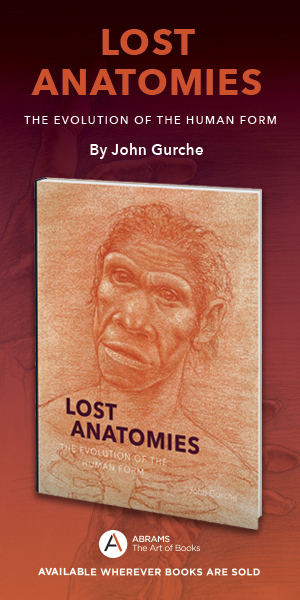 In that respect, those tiny-brained South American monkeys, which last shared a common ancestor with humans more than 35 million years ago, may provide more insights into the early evolution of human family life than do more closely related species such as chimpanzees. Marmoset and tamarin mothers tend to produce twins (together weighing up to 20 percent of the mother’s body weight) as often as twice a year. But the social arrangements lighten the load. Usually, only the group’s most dominant female breeds, although groups with two breeding females sometimes occur. Fathers and alloparents of both sexes are unusually eager to help mothers rear their young. Babies are carried throughout most of the day by one or more adult males, which expend so much energy doing so that they actually lose weight. Other helpers, typically but not exclusively kin, voluntarily deliver even prized animal prey to youngsters. 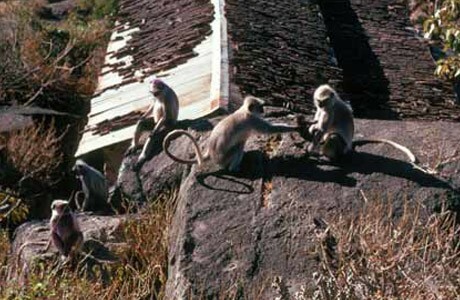 Group members are also unusually tolerant of one another during foraging. Observing moustached tamarins in the wild, University of Illinois primatologist Paul A. Garber recorded only one aggressive act for every fifty-two cooperative ones he saw, such as collaborating to gnaw open hard fruits. When tested in the lab, cotton-top tamarins studied by psychologist Marc D. Hauser’s team at Harvard, and marmosets studied by evolutionary anthropologists Judith M. Burkart and Carel P. van Schaik at the University of Zurich, turn out to be unusually attentive to the needs of others. They are far more willing to deliver food to individuals (including nonrelatives) in an adjacent cage than are chimpanzees in comparable experiments. Marmosets go out of their way to provide food to others, and tamarins even keep track of and reciprocate generosity. 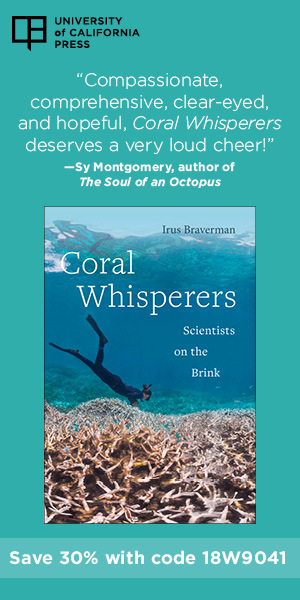 Burkart argues that the combined mutual tolerance and spontaneous generosity of cooperative breeders are conducive to social learning, in particular to the ability of youngsters to glean information from and about their caretakers.